And it struck me that these would be good words for me to put up as ‘A Disclaimer’, for people to read who come to me for spiritual direction. A few weeks ago my seven year old grandson Owen came to stay with us for a week during his summer holidays. He brought with him some loom bands, and was eager to show us how to make them. I confess that I was not immediately enthusiastic but I gave it a try. I was due to lead the communion service in our local church that coming Sunday and my wife, Sylvia, was due to read one of the lessons. We were both committed to be there. I was not sure what Owen would make of our service. He goes to church at home with his mother, my daughter Hannah, but their church is different in style from ours and is much more child friendly. There would be no children at the service in our church, the congregation would be small in number and none of us would be in the first flush of youth. I was not sure Owen would enjoy it much. I didn’t know what to preach about: the set lessons did not strike a spark, and I struggled with what I might say that might speak to both the regular congregation and seven year old Owen. And then I suddenly saw the potential in the loom bands as a prayer tool. The next day I went into our local town looking for loom bands. The first shop where I enquired didn’t have any, but the young boy who was minding the shop with his dad told me that I would find lots of loom bands in a stall in the market. The market is only open on certain days of the week and by chance [?] this happened to be one of them. I found the stall and they had more loom bands than anyone would know what to do with. The stall was run by another man who had his young son to help him. It was the school holidays after all! They were keen to explain loom bands to me. On a hunch I explained that I was a priest and I was thinking of teaching the people in my local church how to use them as a way of praying. Rather than thinking me quite mad the man told me what a good idea he thought that was and began to tell me his story of growing up in a Christian community in Scotland with which he had lost touch much to his regret. We shared a deep conversation, and I went away with a box of loom bands and a growing conviction that using them on Sunday was a good idea. When I got home I explained to Owen and Sylvia what I had in mind, and said that if this was going to work I would need their help which they agreed to give. On the Sunday morning when I stood up to preach I explained to the congregation that I was going, with Owen and Sylvia’s help, to show them how to make a bracelet of loom bands. I said that there were three reasons for doing this. The first was that they would look cool and groovy wearing a bracelet made up of loom bands and that their street cred with the young people whom they knew would rise exponentially. The second was that a loom band bracelet has the potential to be a valued aid to prayer, and that once they had made for themselves I would explain how. The third reason I would explain at the end of the service. So we set to, to make our loom band bracelets. It is not that difficult. Any small child can show you. Owen showed the congregation that morning, and Sylvia and I helped. 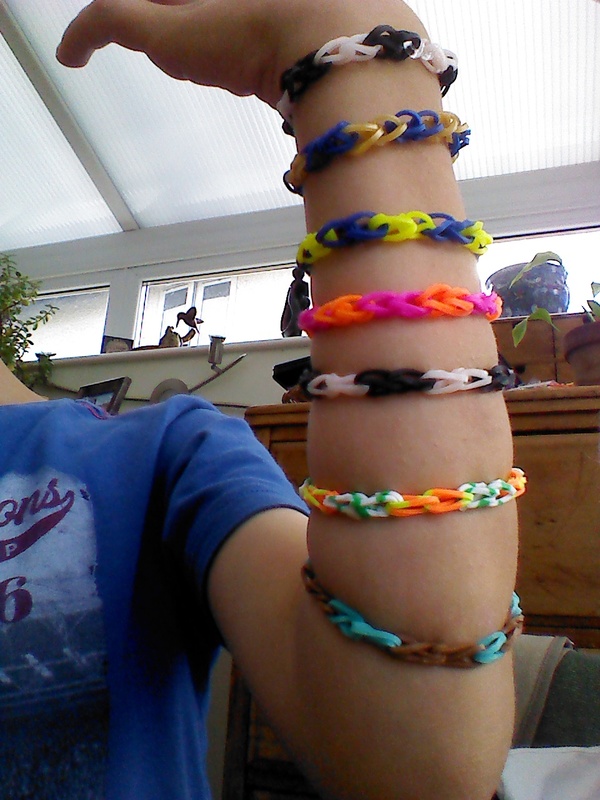 I suggested that about twenty loom bands were needed to make a bracelet and that people might like to choose ten each of two different colours; and then make the bracelet with alternating sets of two bands of the same colour: i.e. two red bands followed by two blue ones and so on. Some arthritic fingers didn’t find this too easy, but we had some that Owen had ‘made earlier’ for that eventuality, and soon everybody was wearing a loom band bracelet. Right, I said, now with the bracelet on one wrist, use the other hand to hold the first set of coloured bands between your first finger and thumb and name to yourself and God someone whom you love and whom you hold on your heart; and then continue around the bracelet naming someone different until you have named them all. You might need to travel around the bracelet more than once! It’s as simple as that. What we are doing here is both simple and quite profound. We name these people whom we love before God in prayer; but these are people who are always on our hearts, we are just bringing them into conscious mind when we pray in this way. So wearing our loom band reminds us when we are not consciously praying, that these people are always on our hearts and because God knows the secrets of our hearts, in reality we are always praying for these people whether we are consciously aware of it or not. There is more. There are certainly, known to us and not known, people out there who carry us on their hearts. They may or they may not pray for us with loom bands, but because they carry us on their hearts, they are in fact always praying for us and God will hear their prayer. My loom band reminds me that I am never alone: I am always being prayed for by someone. There is more. There were sixteen of us in church that morning: not a large number. But we were each of us connected in prayer with a large number of other people in a network not unlike a spider’s web, and each spider’s web would have interconnections with other ‘spiders webs’. In reality the whole world is held by a series of interconnecting webs of prayer of which each of us is inevitably a part, whether we are aware of it or not. And the whole thing is upheld by the prayer of God who of course holds everyone in His/Her heart. The loom band bracelet symbolises all this and can remind us of it. 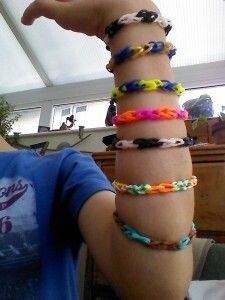 At the end of the service, before the blessing, I told the congregation the third reason for making the bracelets. If you wear your bracelet someone, sometime is bound to ask you why you are doing so. And you can explain to them why you do. In a small, but not insignificant way, you will be engaged in what the church rather pompously calls ‘mission and evangelism’. Many of us feel awkward and shy about ‘mission and evangelism’ but this is a painless and natural way of doing it if the opportunity arises and possibly the more effective for that.